This is a story about an incredible error, an act of respect, and a multicentennial game. As I wrote to Alexander Rose, some years ago the mystery of the Lost Da Vinci is still in the news after five centuries and it intends to stay there. This story is also a bridge between California and old Italy, as Maurizio Seracini is a UCSC San Diego graduate and the director of CISA3 at the San Diego’s Center of Interdisciplinary Science for Art, Architecture and Archaeology. Seracini has been investigating the historical account that says that an original Leonardo Da Vinci, a fresco celebrating the Battle of Anghiari, is hidden by another fresco produced by Giorgio Vasari in the Salone dei Cinquecento (The Renaissance Room) in Florence’s Palazzo Vecchio and tried to prove its veracity. For many years Seracini worked on replicating the techniques that Leonardo employed to paint the lost Battle of Anghiari. As the story goes, it was Niccolò Machiavelli that signed the contract with Leonardo Da Vinci to produce a fresco celebrating the strength of the Florentine Republic. His rival Michelangelo had been commissioned to paint on the opposite wall, but this project was abandoned at the design stage when Michelangelo was called to Rome. The artists were asked to depict two outstanding victories of the Florentines: the Battle of Càscina for Michelangelo and the Battle of Anghiari for Da Vinci. At that time, Leonardo had already painted the Last Supper at the refectory of Santa Maria delle Grazie in Milan using an experimental technique that made the fresco very unstable. For the Battle of Anghiari, he took an even bigger risk and tried an even more experimental technique – which ended up in a total failure. To put it in Silicon Valley terms, this turned out to be the beta version that you wouldn’t really want to go public. Leonardo’s experiment used a special recipe that required oil, wax and fires burning for days to dry the painting surface. The paint, unfortunately, melted. Probably, the final result presaged Italian 20th century art, in a mix of Alberto Burri and Mario Schifano. But for the Renaissance standard, it was considered a total failure and it left Leonardo frustrated. He finally gave up in 1504, leaving only an exquisite, unfinished drawing on the wall. Some years later, Giorgio Vasari was asked by the new De’ Medici government to paint over Leonardo’s disaster. The painting thus disappeared and the legend of the Lost Da Vinci became history. Vasari was asked by Cosimo I De’ Medici to paint a new scene and give a new structure to the whole room, to represent the success of the Medici on the Florentine Republic. Vasari’s respect for the genius of Leonardo was enormous, but still he was ordered to destroy the artwork. Today we know the beauty of the original drawings and sketches thanks to the transmission of copies, including the famous copy of Rubens. The Head of a Warrior of the Ashmolean Museum of Oxford has a side that has dimensions compatible with the cartoon of La battaglia di Anghiari – it also has traces of the little holes that were made to transfer the figures to the wall. On 12th March 2012 Maurizio Seracini announced that traces of a special pigment were found in a back wall – a recipe that only Leonardo used. “It appears to be a pigment used by [him] and not by other artists.” said Seracini. 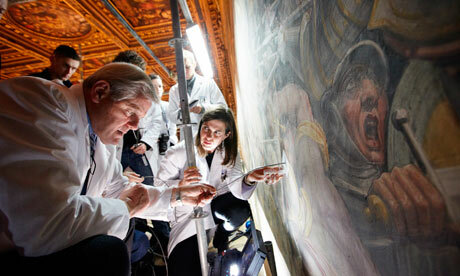 The local national authorities are supporting the endeavour to verify the presence of Da Vinci’s work. There is still a long way to go before we can make a visit to see the remains of Leonardo’s imperfect creature and probably one of his most human gestures. Vasari may have wanted to preserve the traces of Leonardo, protecting it for the centuries to come. Over the surface of his fresco, Vasari wrote a small phrase: “Cerca Trova,” or “He who Seeks, Finds.” The words are in an area of the screen that a viewer can hardly see and not connected with the scene depicted. Maybe it’s a suggestion for people like Maurizio Seracini, as if it were a challenge. Whatever the politicians may have ordered, Vasari decided that the genius – or the error of the genius – must not be deleted from the surface of universal memory. When you want to preserve something, maybe the best strategy is to hide it.